Looking for a program both entertaining and enlightening? Digital Physiognomy reads a person's face and tells you about the secret character traits of that person with remarkable accuracy. A person's facial features (eyes, noses, ear lobes, chins, eye brows, cheekbones, and foreheads) all carry valuable information easily revealed with Digital Physiognomy. Digital Physiognomy comes with a set of more than 1000 faces that belong to famous people. ...... Power, even Luck. Importantly, Digital Physiognomy does not require a photograph of a person. Digital Physiognomy uses a technique analogous to police sketches (sometimes called photo robot). The user simply chooses among eyes, noses, ear lobes, chins, eye-brows, cheekbones, foreheads, and other parts of a human face to create a sketch that closely resembles a person. To check program's accuracy, it is recommended to create a self-portrait first. Digital Physiognomy comes with a set of more than 500 faces that belong to famous people - Churchill, Mao, Tom Hanks, Einstein, Chaplin, Stalin and some others.Only facial features that can be interpreted by physiognomy were used. 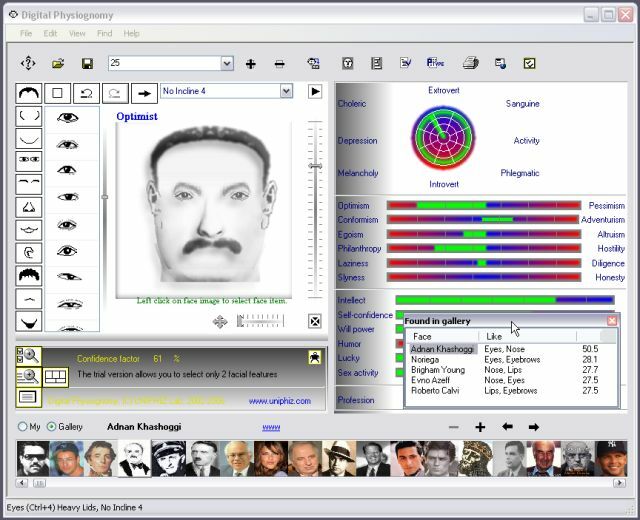 Digital Physiognomy determines a person's psychological characteristics and presents a detailed character analysis of that person in a graphic format. You may then print a report or save it as a web page. Qweas is providing links to Digital Physiognomy 1.78 as a courtesy, and makes no representations regarding Digital Physiognomy or any other applications or any information related thereto. Any questions, complaints or claims regarding this application Digital Physiognomy 1.78 must be directed to the appropriate software vendor. You may click the publisher link of Digital Physiognomy on the top of this page to get more details about the vendor.